During your beach day at Divi Little Bay Resort, rest assured that all amenities are available to you. In addition to a private white sand beach, your day pass grants you access to restaurants and cafes, shops, bathrooms, and unlimited use of snorkeling equipment. 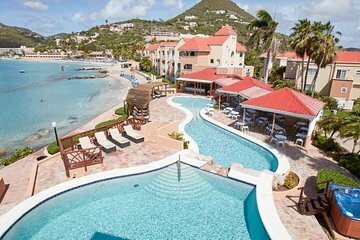 With chairs and umbrellas included, a visit to Divi Little Bay is a popular choice for families. Staff very friendly and helpful. Resort is gorgeous and extremely clean. Snorkeling gear available to use for free. We ate at the outdoor bar/restaurant, food was delicious. Perfect for a day pass while we visited St. Maarten on our cruise.